The Wait For File event pauses the project run until something happens to a file. The project run will continue when the given file has been created. The project run will continue when the given file has been deleted or moved. The project run will continue when either the given file's length or modification date has changed, relative to the length and modification date which were observed when the action started. The project run will continue when the file has its Read Only flag cleared, and is not locked for write access. 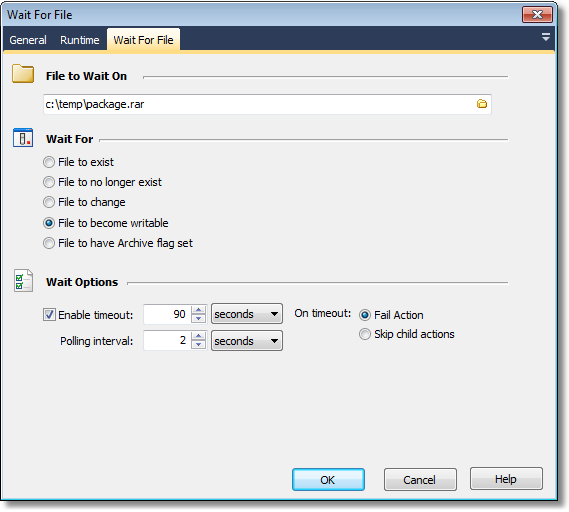 In the example screenshot above, if Package.rar is being created when the action runs then the run will pause until the archiving process is finished and the file has been closed. The project run will continue when the file has its Archive (A) bit set.